Vivo demonstrated a new concept device called the APEX, that includes several new innovative technologies. 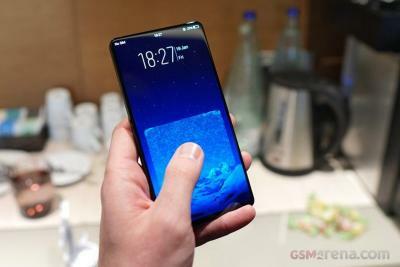 The most impressive is the front display, which is a 5.99" 2160×1440 flexible OLED display that is almost completely covers the front of the phone - the top and side bezels measure just 1.8 mm and the bottom is 4.3 mm. This is an impressive design - but it causes some problems - for example there is no room for a selfie camera, and Vivo solved this via a pop-out camera unit (which looks like the popping flash units in pocket cameras). The design also leaves no room for a speaker - and Vivo designed a new Screen SoundCasting technology which vibrates the whole display, similar in a way to LG's CrystalSound TVs. The APEX also includes an under-the-OLED fingerprint sensor. This solution was released for the first time in Vivo's X20 Plus UD smartphone last month, based on Synaptics Clear ID solution. The APEX improves over the X20, as the whole bottom half of the phone can accept the fingerprint, and you can even input two fingerprints at once.